15 ways to Spice up your life, literally! I have a lot of reasons to praise spicy Indian food with a list of spices and their health benefits in this blog. One reason is to present my perspective of growing up as a Pizza loving urban middle class Indian, who finally became a Masala Dosa craving Indian expat in Italy. I still remember relishing oregano and mustard sauce on my chicken calzone prepared by the nearby Slice of Italy pizza place during my student time in India at IIT Delhi. A decade later I eagerly stack up on exotic spices for home cooked Indian cuisine in Milan. The grass is always greener on the other side is what most people would say about this phenomenal shift in taste. I would say that you only realize the true value of something when you are actually deprived of it. With time, I discovered how to eat healthy on a tight budget by cooking simple products with an assortment of spices. I have always found flavorful hot Indian food perfect for a family meal in winters. Living in Europe for more than 7 years, a visit to my brother’s place in Germany when our parents had visited from India was bound to be very memorable. To have your mom cook you some good food in European winter is a luxury for Indian expats. We had a pretty round dining table mounted with German cutlery and warm Indian food. While it snowed outside in Bavaria, we had Chicken curry, fried vegetable sabzi, lentil based sambar, chapatis, rice and fresh yogurt accompanied with some Italian wine for lunch. I would have preferred my favorite spice filled Indian dish the Biryani but we had boneless chicken that day. The first thing to come to my mind when I think about mixing Italian wine with Indian food is my wonderful stay at Via Alzaia Naviglio Pavese in Milan. My very first year in Italy I had to learn a lot from scratch. Fortunately, me and Puninder my fellow Indian colleague from Bocconi found the perfect place. We were moving in an apartment with two wonderful flatmates who would introduce us to Italian culture and traditions. On the other hand, most of my Italian flatmates have always been very fascinated with my spicy Indian cuisine. As years passed by as you eat more good food, your cooking also evolves. I begun to increasingly research more on Spices not just to discover new flavors, but also to understand the medicinal value in my favorite spicy Indian dishes. My online research would astonish me. I now know how to take care of an aching tooth with cloves and garlic and how Asafoetida can be an effective treatment for hysteria, mood swings, chronic anxiety, depression, and stress. Research on the benefits of spices in food and how they became more popular around the world is very interesting. Just like today, how people get super excited with lucrative start ups, historically spices have created similar entrepreneurial zeal. As explorers discovered new lands, traders would take up massive risks to make a fortune in spice trade. The benefits of spices in food from adding flavors as well as hiding lack of freshness in meat ensured a steady demand. The profitability and the health benefits of different spices may have even motivated Columbus to find a sea route to India and beyond! Historically, spices from India have always been very much desired in the world. Even today India exports about 900,000 tons of spices and spice products worth over 2.5 billion USD. Chilli, mint and mint products, cumin, spice oils & oleoresins, pepper, turmeric, coriander, small cardamom, curry powder/paste and fenugreek made up the major spice exports from India. Each of these spices are desired for their unique flavors but they also enhance your diet with various health benefits. To understand the medicinal value of spices, I decided to compile my spice research in a table for 7 health benefits starting with the letter A. This is just my small list of spices and their health benefits. Spices and health is a topic that has really fascinated me for a long time. I hope this spices and health benefits chart motivates more people to eat healthy while exploring new flavors and tastes. Spicy Indian food saves trips to the supermarket? Apart from buying fresh chicken and vegetables we really did not have to bother much about buying other perishable products. The Bread or Chapatis are made fresh at home from chapati atta or flour. Rice, lentils (for dal), spices are also dry and hence not very perishable. If purchased in large quantities, the ingredients for Indian cuisine can be very cost effective. Food processing however has not grown much and hence Indian cuisine is traditionally lesser processed. You only buy some English bread or buns if you want to make a sandwich or an omelet for breakfast. It is Chapati, Roti or Parantha for all other meals. The tomato-onion-spice-oil based sauce used in many Indian gravy based dishes can be freshly prepared in the kitchen. Indians living in Europe have however begun using more processed products to help them prepare the meal faster. It is a compromise on taste though, if you use the tomato Passata meant for Pasta in your chicken curry instead of fresh tomatoes. Cost wise, I could buy 1 kilo of premium Basmati rice for 2 € and 5 kilos of Chapati flour for 3 €. While the rice could feed at least 10 meals, the Chapati flour may even feed a small family for a month. Yes, Indian families can have all the bread they want for less than 3 Euros of flour. Even the Chicken curry is a great protein rich dish to feed many people. You could buy a single chicken and chop it into small pieces and cook enough of spicy flavorful chicken curry to fill several plates. Growing up in India, you tend to usually have a vegetarian based diet. Chicken, fish or mutton are special dishes that my family consumed in moderation. Indian food designed for large families is best served hot. The spices and flavors make a delicious meal out of simple products. I could prepare a delicious dish that will have you licking your fingers just with Potatoes, cumin, oil and Chapati flour. Fortunately, I also have some Garam Masala which is a mixture of spices along with packets of spices for dishes like Rasam, Sambar and Chicken Korma. I had never used Asafoetida before in my cooking. My mom fortunately gave me a packet of this spice which definitely brought in the missing taste in my Vegetarian cooking. Moreover, it supposedly has numerous health benefits including help with breathing problems and also depression. While Cloves and Garlic may help you with your teeth ailments, turmeric has so much health benefits that it has become an essential part of Indian cuisine. Indian spices and their medicinal uses keeps civilization running in India in spite of minimal spending on health care. The benefits of Indian traditional food may provide answers on how to eat healthy on a budget. Hoping the below list of Indian spices and their uses may provide you some tips on eating healthy. 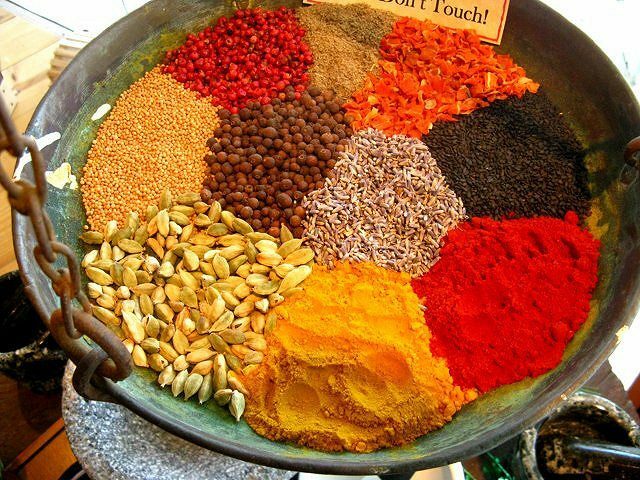 Here is a list of common spices that make Indian food flavorful and healthy. Understanding the medicinal qualities of the things which are used to cook our heritage food is very important. Moreover, understanding metabolism boosting spices may also explain how to eat healthy to lose weight fast. Turmeric is the most commonly used Indian spice. The yellow colored spice contains Curcumin, a cancer-fighting compound. Curcumin has powerful anti-inflammatory effects and is a very strong antioxidant. However, Turmeric holds Curcumin in about 3% by weight. The easiest way to find Turmeric in Europe is to buy the “Curry” powder that is popularly sold in supermarkets. This mixture of spices usually contains Turmeric, Curry leaves, Coriander, Cumin, Fenugreek etc. How to consume Turmeric: Due to the low solubility of Curcumin in water, mixing turmeric with oil makes it effective. Interestingly, black pepper, which contains piperine can also enhance the Curcumin absorption by the body immensely. Turmeric in small quantities goes well in any dish like fried vegetables, rice, chicken, fish and meat. You could also mix it in soups or have a healthy beverage of warm whole milk, honey and turmeric. Cumin is very popular in Indian cuisine and the first cumin based dishes to come to my mind is the Jeera Rice (Rice cooked with tempered cumin) and Aloo Jeera (Potato cubes pan fried with oil and cumin). While Jeera Rice goes well with Dal, the Aloo Jeera goes wonderful with Chapatis. How to consume Cumin: Cumin is usually accompanied with mustard seeds and red chillies in the tempering process to extract the essential oils. Tempering is a cooking technique where spices are roasted in oil before being poured into a dish along with the oil. Native to India, Black Pepper has been a very valuable spice during the medieval ages. Apart from providing an interesting flavor, Black pepper could help disguise lack of freshness in meat products. Black Pepper is filled with several essential minerals and vitamins including manganese, potassium, iron, Vitamin C, K etc . The entire list of the health benefits of Black Pepper may require an other article of its own. How to consume Black Pepper: You really do not need me to tell you that a pinch of Black Pepper goes well with any salt based dish. In any case, these two magic words is all you need to know about Black Pepper in Indian Cuisine: Pepper Chicken. Healthy spices for chicken will always have some pepper included in the list. Pan frying small pieces of chicken with oil, onions, pepper, salt and turmeric leads to one of my favorite Chicken dishes. You can always spice this dish more with other spices like cloves, cinnamon, cardamom etc. But as an Indian living in Europe, I have very recently discovered the taste in using minimal amounts of spice in your food. Here is an interesting story about Chilli Peppers and how the spice native to Mexico became a favorite in Indian cuisine. Spanish ships traveling across from the Americas to Europe would stop by Lisbon, Portugal on their way home. During the 15th century, just after the Americas were discovered, the Portuguese and the Arabs controlled the trade routes to Asia. The Portuguese traders may have got hold of this valuable new spice quite early from the Spanish. They quickly introduced it in India. From India, Chilli Pepper would spread across Central Asia, Turkey and all the way to Hungary where it became the national spice as Paprika. Chilli Pepper contains anti-oxidants, Vitamin C and can even help your body to regulate insulin levels. How to consume Chilli Pepper: Just like Black Pepper there are numerous ways how you can use different varieties of Chilli Pepper. Green Chillies often accompany an Indian meal in raw salad form. It is also chopped up and sprinkled as garnishing delicious Indian curries. But my favorite is the Hyderabadi Biryani side dish Mirchi ka Salan that accompanies the Raita (yogurt based salad with chopped onions, tomatoes, green chillies , salt). Cloves are an interesting spice as you can make anodyne(painkillers) using the essential oils. Moreover you can even cure hiccups with it and the Anthelmintic also gets rid of parasitic worms and other parasites from your body. The spice also adds a wonderful flavor to your food and is present in the Garam Masala. How to consume Cloves: Cloves are usually used in spicy Indian food like a Mixed Vegetables Korma, a Kadai Chicken or a Goan Fish Curry. My favorite is cloves with my milk tea. I have always used cardamom and ginger in my Indian milk tea. But every since I started using cloves there seems to be no going back. Moreover the chai gets a very refined taste. Previous PostPrevious What will you do if I give you 1 crore or 10 million rupees?